First of all, I had mentioned that more than anything, Summers worries about and cares about the banks first. Every motive he has, to the best of my observation, revolves around what is good for the banks at that moment. It may not be a long term fix he has in mind, but he is bank first at least in the now. So, it is no surprise that he says we should have fiscal stimulus to really put the economy on a path towards lift off. He may really want this for benefit to society, but he really mostly wants this because he says there is a shortage of treasury bonds. He says what others have been saying, that bond markets are telling us that there are not enough bonds. He wants more fiscal spending and resulting debt, in order to produce more bonds! That is for the banks, clearinghouses, and derivatives. That creation is for the financial system most of all. A shortage of bonds causes interest rates to experience lower yields and bond prices to go up. Banks don't want to pay too much for bonds and want more bonds available. And it isn't really normal to have this great shortage of bonds, until this new normal, that is. Summers knows this, and wants rates to go up by burying America in a sea of red. Bonds are the new gold to the bankers, but bonds are a burden to the taxpayer, who can't grasp this new economics. Looking at Japan one can think that we could be there some day. Just how much debt can a nation handle before it becomes a big problem. Well, nations probably can handle more than 90 percent of GDP which was a Rogoff austerity idea debunked. But nobody wants to be Japan at 200 of GDP percent either. Gary Gordon had mentioned that long bonds are being gobbled up by foreigners. Debt is increasing fast, as Gordon says, but Summers says it is not fast enough. But recently, China and Brazil and Russia are selling US bonds because of the crisis of capital leaving those regions. Summers acknowledges capital flows out of emerging markets as a reason that the US government must spend. While I believe he is right that most economies, except those with massive export capabilities, cannot self restore, it is still a fearful thing to contemplate massively more in deficit spending. It is a great experiment, after all. I think deflationary pressures of a global economy are not over, and especially, I think that the Fed may want some deflationary pressures, so it doesn't have to act. An economist friend of the Grumpy Economist has said that the Fed bought a lot of long bonds (and I believe has created a market for a lot of long bonds as collateral), so that it cannot raise rates or risk not sending payments to the treasury as it has done for so many years. Grumpy's friend said there could be large mark to market losses if the Fed ever raised rates significantly. So, we need to look at the ways in which the Fed has set things up to predispose it to keep rates low. 1. Grumpy's friend says the Fed can't afford to pay the treasury interest if rates are significantly raised. That is almost a hostage situation. 2. 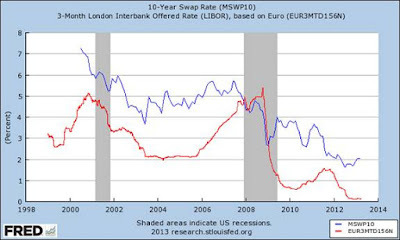 The banks have bet on low rates, taking the floating low side of the swaps bet when they issue loans. 3. The Fed pays interest on the excess reserves in order to restrain lending. 4. Long bonds are in massive demand as collateral, the new gold, and there are shortages, even with BRICS nations selling into a deep market. So, rates are predisposed to stay low barring some unforeseen circumstance. Summers says that all this must be overcome, that the economy can grow (without putting, I assume, those 4 predispositions in danger). But then Summers says what amounts to a mistake. He says correctly that these are the risks: too much capital goes to emerging markets, too much inflation happens or the economy overheats. But then he says, incorrectly, we can use standard approaches to combat those risks. But with the financial system betting on low rates, including the Fed itself, using standard approaches to a raging inflation and overheated economy will destroy the entire banking system. As a rule, higher rates result from a stronger economy. Lower rates are the result of a weak economy. However, with the demand for treasuries as collateral going berserk, the Fed cannot count on the stronger economy to push up long interest rates as the economy overheats. The overheated economy that Summers says could be controlled cannot be controlled by a Volcker-type move. It is not true that the Fed could always use traditional means as Summers has said in the BI article. And this is exactly why the Fed doesn't want it to even come close to overheating in the first place. That means we could be headed for deflation without changing the financial system, and there is nothing that the Fed can do about it. And that deflation will give all of us who fear negative interest rates and a cashless society a real crisis as Summers has warned about in the past. But he is willing to establish a cashless society if it means saving the banks, no matter what hardship it imposes upon the average guy on the street! I believe that in order to return to a normal growing society, Bonds as collateral would have to be banned, and perhaps bonds issued by government would have to be done away with. Nothing will budge the long bonds from their low yields in the current financial system as it is set up. 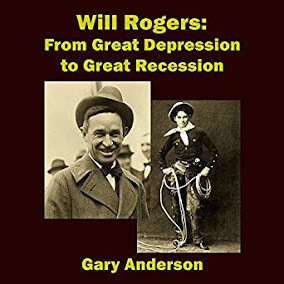 The Fed never has needed control over the long bonds, because demand was not as great for them when the economy was in full throttle, because people moved out of long bonds into stocks. Hence, rates tended to rise, slowing things down naturally. That natural behavior of bonds is long gone, because Greenspan created the Conundrum, and Larry Summers needs to address the difficulty that we face because of that conundrum. And he needs to address new solutions toward eliminating the conundrum.